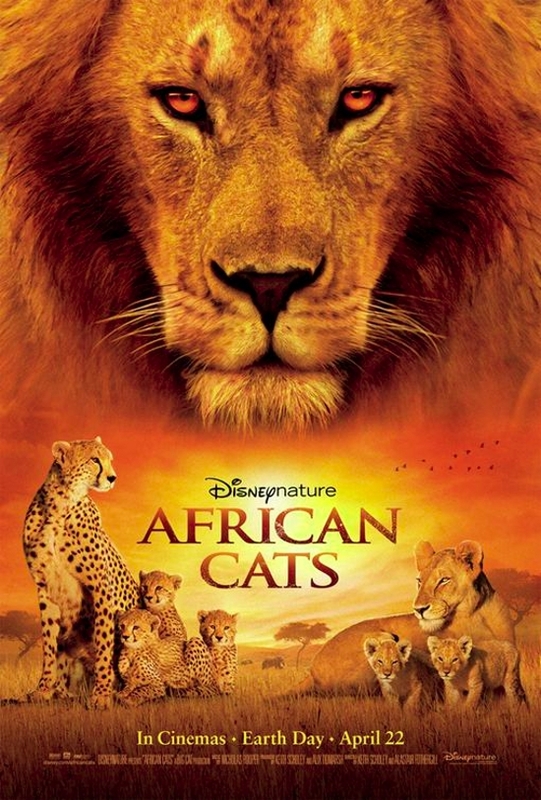 The world of Disney collaborates with several seasoned artists to bring to the silver screen the latest saga in the Disney Nature adventure African Cats. The Disney Studios continue to be the leader of the pack with their nature preservation emphasis and renewed branding in DisneyNature. “Walt Disney was a pioneer in wildlife documentary filmmaking, producing thirteen True-Life Adventure motion pictures between 1949 and 1960, which earned eight Academy Awards®.” In April 2008, over fifty years later, The Walt Disney Studios refreshed their heritage of True-Life Adventure films and coined the project DisneyNature. The Studio’s project now brings the world’s top nature filmmakers together to share a wide variety of wildlife subjects and creates real stories with theatrical balance. The Walt Disney Studios nature-feature documentary “Earth” opened in 2009, and was the first to premiere under the new DisneyNature label. In 2010, “Oceans” appeared on the silver screen and was the third highest grossing feature-length nature film in history. Filmmakers, Keith Scholey and Alastair Fothergill join with narrator, Samuel L. Jackson to take the film audience on a mesmerizing nature safari in African Cats. It’s more than a movie; it’s a true to life close-up, moving tale of the survival-of-the-fittest on the African Savanna. African Cats was filmed in Masai Mara, Kenya over a two year period observing the lifestyle of a variety of African Cats. The diversity of these species lives in a hierarchical world where the Lion is the King. He rules over many animals of the African wild but his pride is the pack of lionesses that follow him day and night. The story with this lot of furry animals begins with crisp cinematography of a real live Antelope Herd making their seasonal trek. Their travel at racing speeds will draw on your imagination of the visuals in the Disney animation feature-film The Lion King. The scenes are incredibly similar though one is the animation copy of the other’s reality. Their movement is absolutely stunning. The beginning to the African Cats story is due to the Herds’ movement. The Herd is generally the Cats’ source of nutrient. So, when the Herd moves, the Cats try to follow but they end up in a different part of the Savanna tundra where they are not in control. Each breed of the big African Cats must manage to survive on foreign soil searching for food and water, as well as, a safe environment for their young. For educational purposes and a fun activity that you can do with your kids go to the Disney Nature website and link http://www.disney.go.com/disneynature/africancats and download the guide. You will engage in conversation with your kids to answer questions such as: How does the African Savanna Compare to where I live? Or, what is in an African Savanna? Or, what jobs do living things have on the Savanna? *Rated: G, but a very slow moving film with up-close and personal cinematography not necessarily appropriate for the very young in some scenes.